As a part of our study abroad program here in Barcelona they occasionally take us on excursions over the weekend. For this most recent weekend, we took a trip to Valencia. I had never been there before or really ever heard of the city but I enjoyed my time there. Easily the most impressive thing I saw there and the city’s foremost tourist attraction was the City of Arts and Sciences. The architecture alone of this area is truly a sight to behold. The project was set up by the Generalitat de Valencia in order to create a landmark that would show Valencia as a place for culture and tourism. The construction of the “city” was completed on April 16, 1998 and it has been expanded upon with newer buildings since then. The area is meant to be a place for cultural and entertainment center that is comprised of five main buildings and other architectural landmarks. The L’Hemisferic is a planetarium and Imax cinema whose architectural structure resembles that of a huge marine isopod. 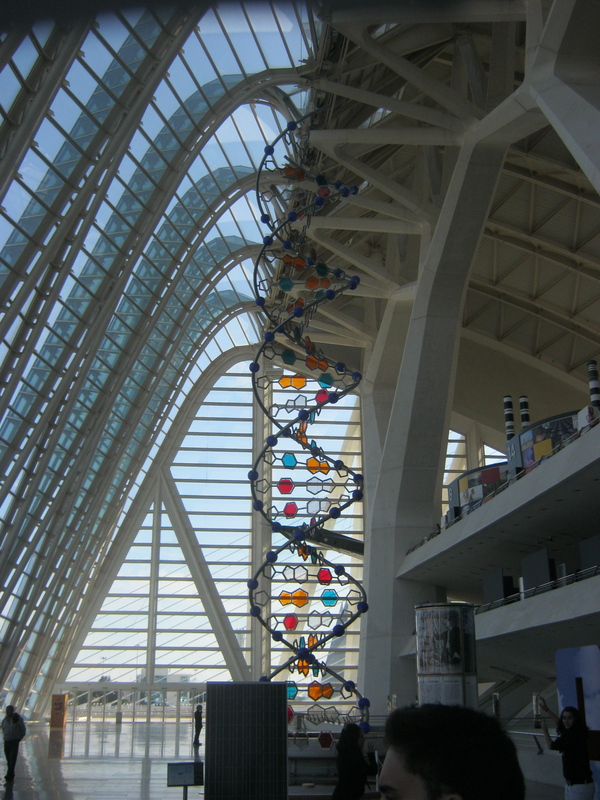 The second main building is El Museu de les Ciencies Principe Felipe that is a three-story interactive science museum, which is shaped like a whale’s skeleton. L’Oceanografic is the largest aquarium in all of Europe with a space of 110,000 square meters and housing 42 million liters of water. It’s shape is designed off of a water lily. El Palau de les Arts Reina Sofia is dedicated to music and the performing arts that contains inside an opera house. The final main building is L’Agora, which is an area for open concerts and sporting events such as the Valencia Open 500, a professional tennis tournament. Here is a video to give you an idea of how some of the structures look and are set up. The complex was built on the end of an old riverbed named Turia that became a garden after the great flood of Valencia in 1957. 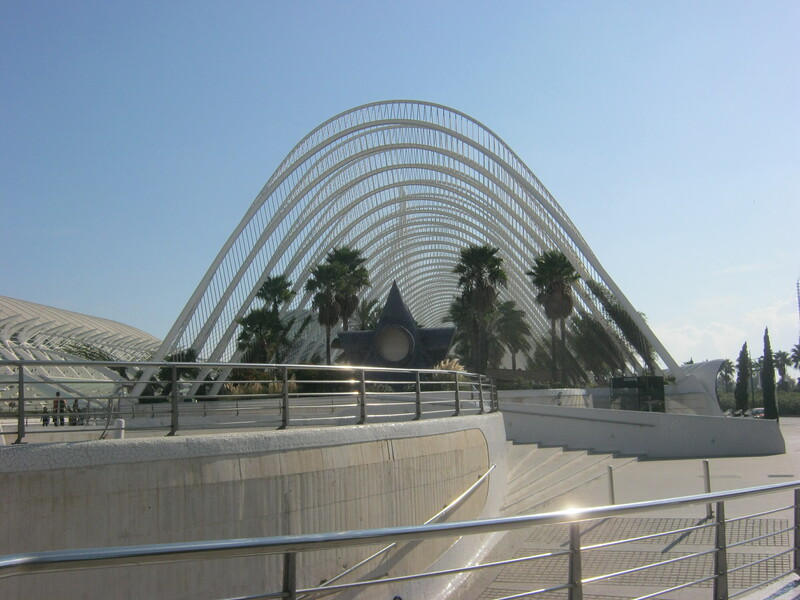 Two prominent Spanish architects named Santiago Calatrava and Felix Candela designed the structures and buildings. 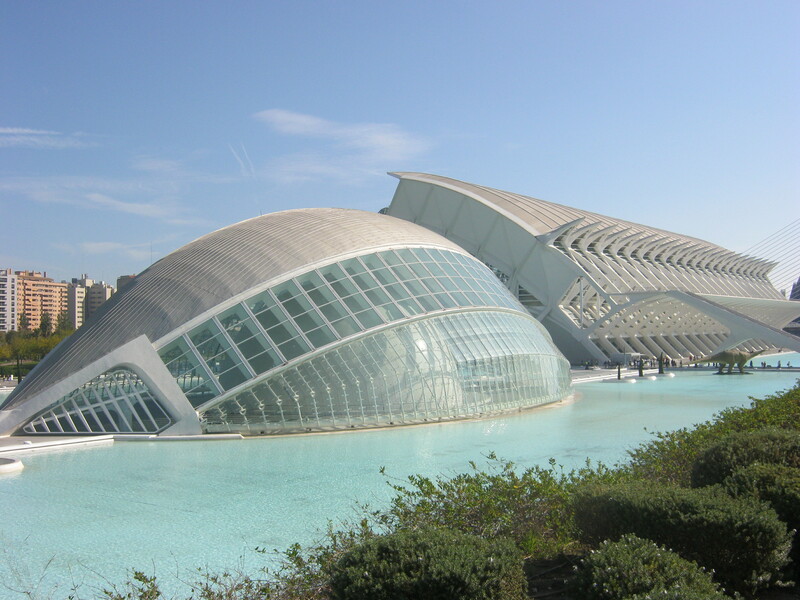 The modern architectural style and color choices of white and blue was meant to merge the idea of the traditional Mediterranean sea and light with a futuristic style that can show Valencia as a modern city with a large past and deep history. Much of the area is surrounded by shallow reflecting pools and the architect Calatrava has spoken on why he chose to design the complex in that way: “As the site is close to the sea, and Valencia is so dry, I decided to make water a major element for the whole site using it as a mirror for the architecture.” All of the structures and surrounding areas tie into the theme of the Mediterranean Sea in some way. There is a large walkway on the side of the buildings called L’Umbracle that consists of many plants and wildlife that is indigenous to Valencia that change depending on the seasons. It also has an art promenade that is an outdoor art gallery that has many sculptures from contemporary and modern artists. All of these structures combine together to make this unique city unlike anything else like it. The main centerpiece of the entire city is the Science Museum located in the middle of the complex which I was allowed access to on my trip there. It was first opened in the year 2000 and has reached over 25 million visitors since that time. This is a very modern museum in the way that it presents its subjects and helps you to learn about them. It takes a very interactive and hands-on approach to teaching you about the various different scientific exhibits. The museum changes its exhibits depending on the seasons and time of year. 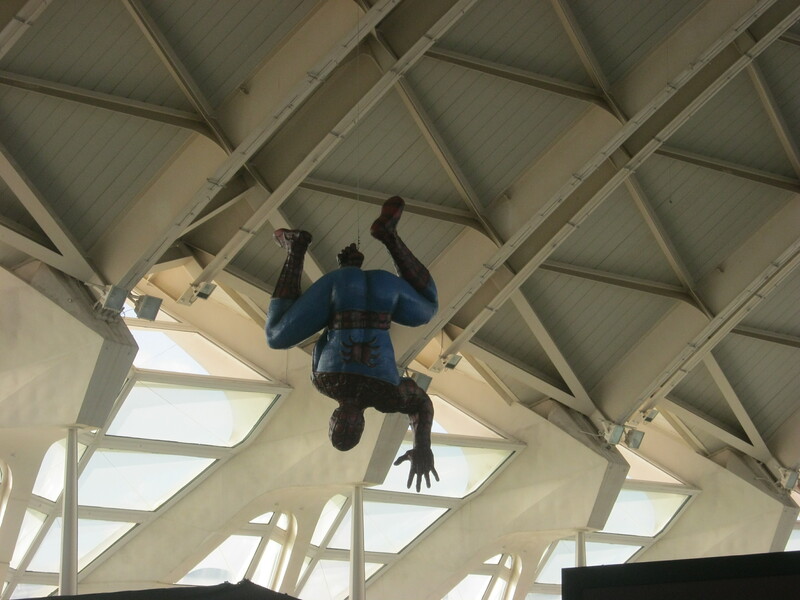 For example, when I went they had a Marvel Comics exhibit, which they used their famous characters to teach younger children how science works. In this way, this museum is forward thinking and revolutionary because it manages to make science fun to kids who would normally be bored by science. The motto of the museum is “Forbidden not to touch, not to feel, not to think” and it gives great insight into how the museum is run and the values it was built on. This allows for the visitor to always be an active participant in the exhibits as opposed to a traditional museum where you are passive and just are fed boring information. The way that this museum is set up fits with the theme of what the whole area was built upon: to be futuristic and modern. The most interesting exhibit on hand to me was the Science and Sport with Valencia C.F. It showed how science and sport are so dependent on each other, which many people don’t think about. Part of it was a history of the storied football history including foosball tables, jerseys, trophies, and an interactive screen, which allows you to relive all the magical moments from the club’s past. The other section delves into how our physical bodies work in conjunction with science to allow for great feats of athleticism. It shows how physics change a trajectory of a soccer ball on it’s flight to the goal depending on how you hit it. It also focuses on health sciences such as seeing your vertical jump, and ways to measure your body mass index depending on your height and weight. This exhibition and the museum as a whole allow us to look on everyday things and seeing the way science plays a vital role in all of our lives. Whether it is climate change, space travel, marvel superheroes, or soccer we can all learn some important scientific facts while having a fun and interactive experience at the Science Museum Principe Felipe at The City of Arts and Sciences. Above is a video I recorded by interviewing a visitor to the museum to see what he took away from the experience he had.